The index opened strong above 8800, but profit booking saw the index close in Red at 8743.95, loss of 25.20 points. The broader market though was positive with 963 advances to 668 declines. Range stays at 8500-9000. Call option 8700-9300 added 11.63 lacs OI with short covering at 8500 and below strike prices. Put option 8800-8000 added 11.17 lacs OI with short covering at 8900 and above strike prices. 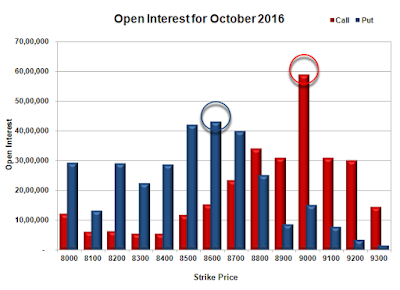 Nifty Open Interest is at 2,22,96,375 up by 1,00,875 with decrease in price, probably short build-up. Bank Nifty Open Interest is at 19,60,240 up by 26,640 with decrease in price, probably short build-up. 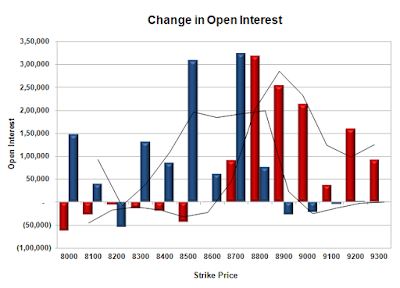 FII’s bought 2639 contracts of Index Futures, which includes net 4682 contracts long build-up and 2043 contracts short build-up, with increase in net OI by 6725 contracts, includes 20480 longs to 17841 shorts for the day. FII’s Index future open contract as on date is 234236 Longs to 40085 Shorts, Net long 194151 contracts. Initial support at 8700 with OI of 39.88 lacs and below that at 8600 with OI of 43.03 lacs. Initial resistance at 8800 with OI of 34.17 lacs and above that at 8900 with OI of 58.95 lacs. 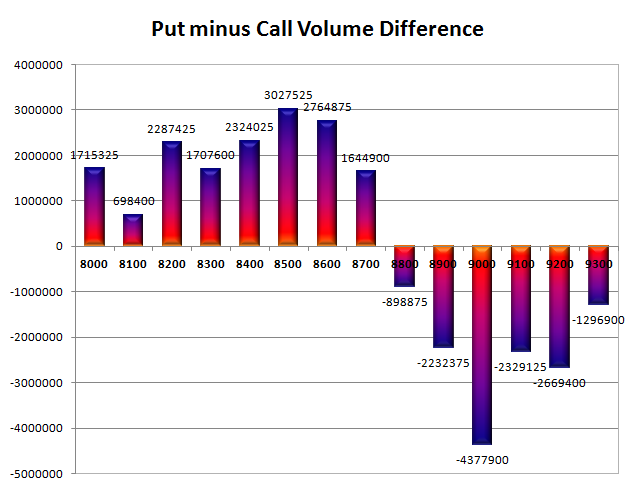 Day Range as per Option Table is 8688 - 8826 and as per VIX is 8676 - 8812 with 8761 as the Pivot.